The first gay pride march took place in New York City on June 28, 1970 — the one-year anniversary of the Stonewall Riots. October is LGBTQ History Month, and to celebrate, NBC News will feature an NBC Out #FlashbackFriday review of key moments and people in LGBTQ history. Each week’s feature will include images from the New York Public Library’s LGBTQ archives. This week, we look back at the country’s first gay pride march — held in New York City on June 28, 1970, the one-year anniversary of the Stonewall Riots — and what led up to that historic event. Early Saturday morning on June 28, 1969, police staged a raid at the Stonewall Inn, a mafia-run gay bar in New York City's Greenwich Village neighborhood. Unlike the many previous raids that had taken place at the Christopher Street establishment, this one inspired the bar's patrons to fight back. The Stonewall Riots, as the days-long protest became known, is credited as the spark that ignited the modern-day LGBTQ-rights movement. The week following the protests, Village Voice writer Howard Smith described the "strange mood" when when police first ejected Stonewall’s patrons out onto the sidewalk under a full moon. What had been a routine crackdown on an illegal bar took a turn when pennies and dimes started to whiz through the air and toward the police. The cops barricaded themselves into the bar, and then the gay mob outside the bar began to throw bricks and rocks toward the door and tried to break through the boarded up windows. Just a few days after the Stonewall Riots, gay activist Frank Kameny loaded up a bus with fellow activists and headed down to Philadelphia for the fifth “annual reminder” picket protest outside Independence Hall. According to historian and author Lillian Faderman, these picket protests were “staid” and reflected Kameny’s desire for gay integration into society and the workforce. Women wore skirts and blouses, men wore suits, and there were no public displays of affection permitted. But at the 1969 "annual reminder," Faderman said, it became clear to Kameny that things had changed following the Stonewall Riots. “Two of the young women who came with Kameny started to hold hands, and Frank immediately ran up to them and banged their hands apart and said, ‘None of that here,’” Faderman recounted. “The kids who had come from New York were angry and started to protest" Kameny's conservatism. Inspired by the African-American riots in response to the assassination of Dr. Martin Luther King, Jr., and massive protests against the Vietnam war, young gay activists demanded faster and more radical change. “I think that was probably Frank’s first realization that this was a new order, things were changing,” Faderman said. Soon after the 1969 "reminder", four activists — Craig Rodwell, Fred Sargeant, Linda Rhodes and Ellen Broidy — decided to attend a regional “homophile” conference and “propose that the staid ‘annual reminders’ of homophile pickets at Independence Hall in Philadelphia, held every July 4 for the previous five years, be replaced by a march in New York City," Faderman said. The men were members of the Homophile Youth Movement in Neighborhoods, and the women members of Lavender Menace. The activists decided to commemorate the Stonewall Riots with a march on the event's one-year anniversary: June 28, 1970. 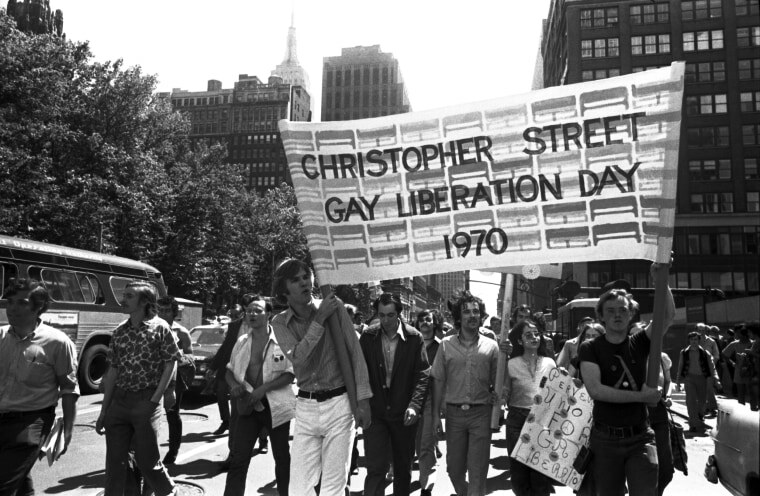 That first march was named "Christopher Street Liberation Day." Since so many people were still in the closet, the straight world was simply unaware of how many LGBTQ people lived and worked beside them, according to Faderman. By many accounts of people who attended New York’s first pride march, it started small — just a few hundred people downtown in front of the Stonewall Inn — but by the time it arrived 50 blocks north, at Central Park, the crowd numbered in the thousands. The march stretched 15 blocks — three quarters of a mile — at its longest, The New York Times reported. There were also two “very small marches” in San Francisco and Chicago that year, according to Faderman, but by far New York City’s was the largest. “We're becoming militant, and we won't be harassed and degraded any more,” Martin Robinson, a member of the Gay Activist Alliance, told The New York Times. Now, nearly five decades after that first "Christopher Street Liberation Day" event on June 28, 1970, the annual NYC Pride March draws millions of participants and onlookers.